Walk in the footsteps of Harry Potter, Flash Gordon, James Bond and Batman with the launch of a new movie map. 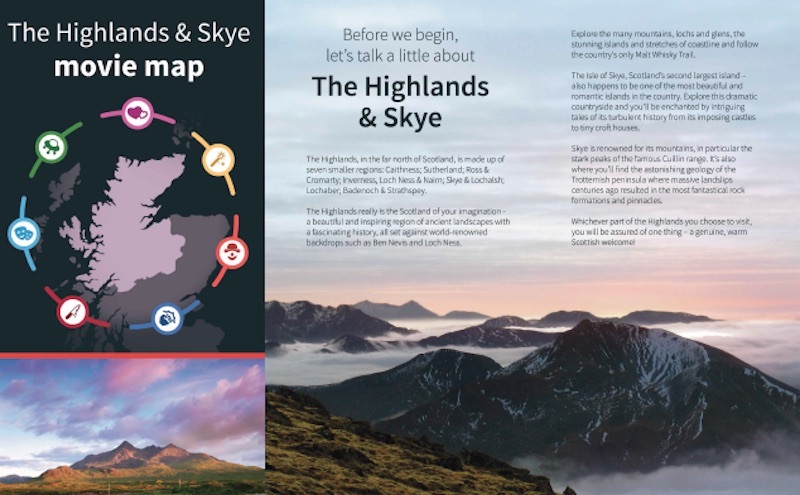 Created by VisitScotland and The Highland Council, The Highlands & Skye Movie Map highlights 50 filming locations and features everything from Hollywood blockbusters to low-budget horror flicks. The easy-to-follow guide capitalises on the popularity of set-jetting, where film fans visit real-life movie locations. Among numerous other locations, the map features Eilean Donan Castle (as seen in Highlander and The World is Not Enough); Glen Coe (Skyfall and Alfred Hitchcock’s The 39 Steps); and Glenfinnan Viaduct, which plays a starring role in the Harry Potter movies. Ridley Scott’s Prometheus, Snow White and the Huntsman and the Gaelic language film, Seachd: The Inaccessible Pinnacle are among those to be filmed on Skye, and it can also be seen in the upcoming Macbeth, starring Michael Fassbender.